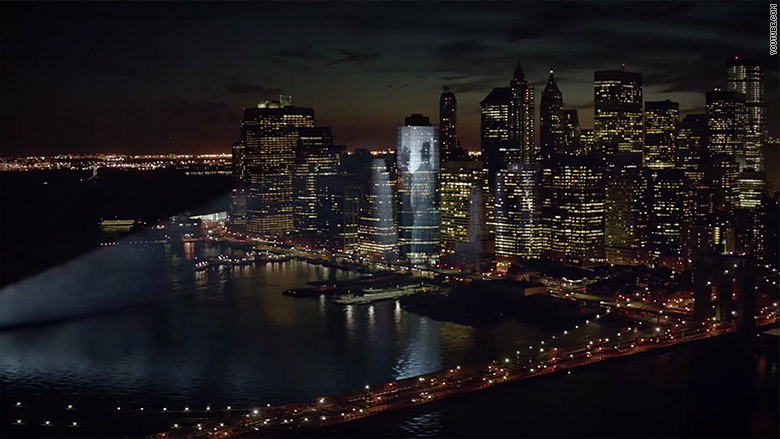 A new AT&T commercial imagines a movie projected on the side of a downtown Manhattan skyscraper. Just three weeks after completing its acquisition of DirecTV, AT&T is rolling out ads to market its new packages of wireless phone and satellite television service. "AT&T and DirecTV are now one, bringing your television and wireless together, taking entertainment to places you never imagined," a new 60-second commercial says. The ad will begin airing on TV on Saturday during the PGA Championship. AT&T isn't revealing how much it is spending, but it's buying air time on 6 broadcast networks and 38 cable channels. It's also buying ads in newspapers, on web sites and on social networking sites. The ads are highlighting something that every major media company is prioritizing: mobile access to TV shows and movies. Now that it owns DirecTV, the country's largest provider of satellite TV service, AT&T is offering packages that combine wireless phone service with a satellite TV subscription. "This might sound bold, but we believe our new company is revolutionizing the way you consume entertainment," Lori Lee, AT&T's global marketing officer, said in an interview. 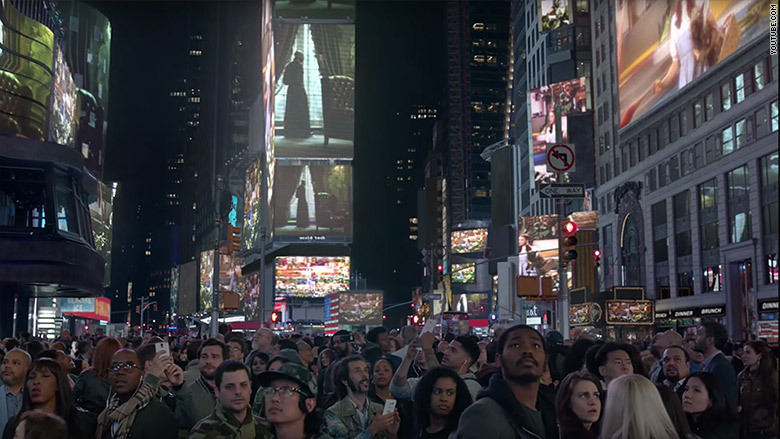 The new ad shows a scene from The Matrix projected in Times Square. Lee said the new ad campaign is intended to "make the market know what once was only a possibility is now a reality." That is, in-home and out-of-home access to a wide array of entertainment. These are sometimes called the "anys" — anything, anywhere, anytime, on any screen. It sounds great in theory but it's been hard to implement in reality. AT&T says the integration of DirecTV is helping it get there. "Many campaigns deliver 'Someday, you will.' Our company and this campaign deliver 'You can now,'" Lee said. The ads show famous film sequences (from "The Wizard of Oz," "The Matrix," and "Home Alone") on billboards, big-screen TVs, smart phones, and tablets. They also peer into the future by showing people watching video on watches and curved projection screens. The TV ads were directed by Rupert Sanders, a well-known director of films and ads. It was shot on location in Times Square.